PARX: Try Salesforce free for 30 days! Register now to get 30 days of access to the Professional Edition of Sales Cloud. And discuss with us how we can adapt Salesforce to your needs and processes. We look forward to providing you with the support you need throughout the trial phase. 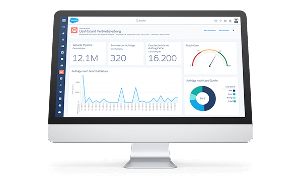 You can register with Salesforce for the free 30-day trial version here. Would you like us to support you during the trial phase? Would you like to discuss individual questions with a Salesforce expert in your local area? Then request our free support service for your 30-day trial phase. We look forward to providing you with the support you need. Free up the full potential of Salesforce. The largest team of certified Salesforce specialists in Switzerland and Germany at your disposal. Experts and consultants who are actually based in Switzerland, who have experience with the CRM business and processes at a local and international market level. For over 14 years, PARX has acquired experience with more than 1000 Salesforce projects.